Each model features 8 high speed servo driven slides, servo wire feed, servo moving wire line, servo rotary wire, servo rotary quill, 2 twin servo spinners, 2 regular spinners, servo rotating tool holder, and servo cutter for larger wires. Each model features high speed servo Cam axis to drive slides, servo Wire Feed, servo Rotary Wire, servo Rotary Quill, 2 servo Spinners, and servo Looping Station for Extension Springs. NuCoil introduces the next generation, digital servo motor and control system from Austria to be used on its future spring machinery. Using absolute positioning system, it is up to 200 times more accurate than current competitor's analog servos with incremental encoder. It runs at up to twice the speed, all without homing sensors or limit switches. Unlike the competitor's slow, software/servo board controlled servo systems (which runs into bottlenecks and synchronization issues at just 8 servos), the movement and synchronization is controlled directly at each servo drive. This gives us the capability to control AND synchronize up to 200 servo motors effortlessly and with high accuracy. January 1, 2001: NuCoil USA Moves to a New Facility! To provide you with exceptional service and support, we have moved to a new state-of-the-art building in Bristol, CT. The 7,600 sq. ft building will be used for showroom, training facility, office and warehouse. We encourage all current and potential customers to visit our facility in Bristol, CT.
August 15, 2000: NuCoil Taiwan Receives ISO-9001 Certification! NuCoil has reached a major milestone today as its manufacturing facility received ISO-9001 certification from TuV Rheinland, Germany. This certification re-affirms our committment in bringing quality machinery to you, our valued customers. As part of our promise to bring you high quality, versatile and cost efficient machinery, NuCoil Industries Co., Ltd. has moved to its new manufacturing facility in Taoyuan, Taiwan. This brand new facility features a total of 7 floors totalling 35,000 square feet of space for manufacturing and office. 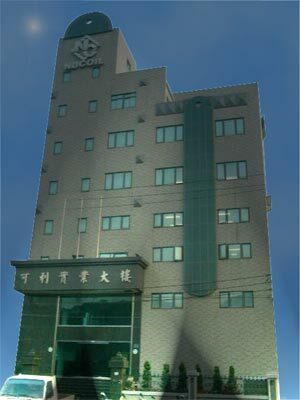 We encourage all customers to visit our new manufacturing facility in Taiwan.